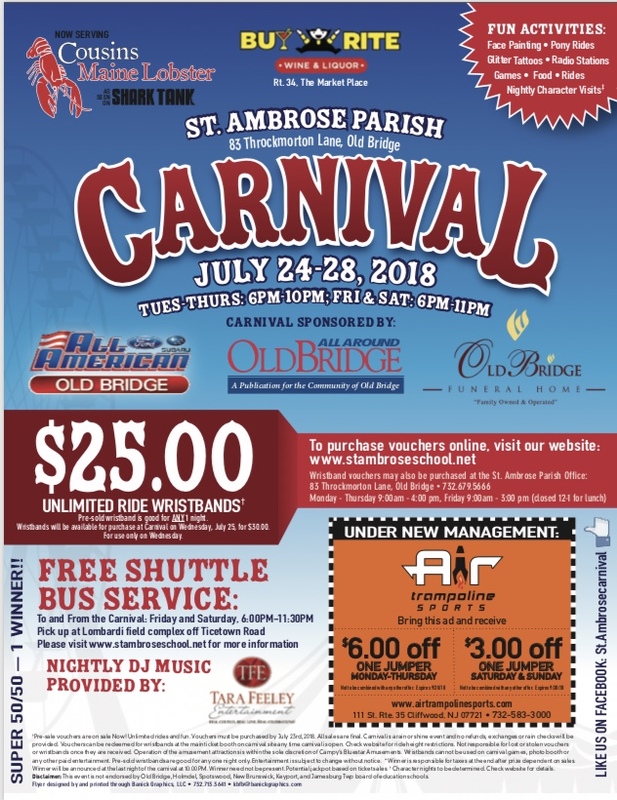 St. Ambrose Parish in Old Bridge will be holding their Annual Carnival from Tuesday, July 24th through Saturday, July 28th at the church grounds. The five day carnival will feature over 19 amusement rides for all ages, delicious food including Cousins Maine Lobster ( as seen on Shark Tank ) carnival games, vendors, Super 50/50 raffle, live bands on Friday and Saturday night as well as DJ music all week, pony rides, face painting, and much more! Pay one price ride wristband night is Wednesday, July 25th for $30 per wristband. Pre-sale ride wristbands are available for $25 each at www.stambroseschool.net until Monday July 23rd at 11:59pm. Pre-sale wristbands are valid any one day of the fair. 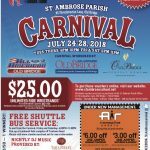 Free shuttle bus service will be provided to and from the carnival. Please visit www.stambroseschool.net for more details.